Your C.V.V.A. application for membership has been sent and will be reviewed by our membership committee for acceptance or rejection. You will be contacted in a timely manner at the email address or phone number you chose for us to correspond with you. We require a copy of your DD form 214, or other documentation for proof of service for certain memberships and will be retained for our files. 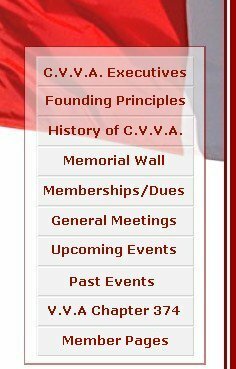 The membership dues are $25.00 (annual) and $150.00 (lifetime). © 2007 vva.ca All rights reserved.